Malvin Artley, our regular esoteric commentator examines the subtle meaning of the Full Moon in Pisces for 2009. This is Virgo's Full Moon, as the Moon is full in the sign opposing the Sun. The full moon of Virgo (the full moon at Pisces 12º15') occurs on the 4th of September 2009 at 16:04 UT and 12:04 PM EST in the US. This is 2:04 AM AEST, Sep 5 (Sydney time). When I was growing up my mother used to come out with some statements at times that would just floor me. One that I particularly remember was said several times, especially just after I graduated high school, and I will get to it in a few lines. When we are teenagers our parents can often seem daft or a like they couldn't have a clue at times, but I have since come to see the wisdom she had, and my father too for that matter. Quite naturally at that time I was questioning what I was going to do in life. I was at university and had not yet decided on my major. I was thinking about where I wanted to be and the direction my working life would take after school. I was still living at home, whereas a lot of my friends from high school seemingly could not wait to leave home and get on with their lives. I was happy at home, though, and my dad taught at the uni, so I had a pretty good deal there. Still, the questions about my life would roll around in my head and there was a part of me that was concerned about leaving home and how mom would feel about that (the sign Cancer is prominent in my chart). My mom picked up on it. Mothers always know, you know? So, one day when I was at home between classes she sat me down and had a heart-to-heart with me, looked me in the eye and said, “You know, we raised you kids so you could leave home.” Then she just sat and looked at me, waiting for a response. Once I got over my initial disbelief, I thought about what she said. She made a lot of sense, and after that time I never worried about my mom any more, at least not for a long time. After her statement I obviously looked a bit stunned and she just smiled at me, but I thanked her for her words, at which point she got up from the table and got about the rest of her day, leaving me there to contemplate what had just transpired. I don't know why it affected me so strongly, but it did. She said the same thing on a few other occasions as I was going along in life, but I will never forget the statement. I think the thing that really got to me was the fact that she had faith in me. I didn't have so much in myself at that point. That would come later. Of course, then my mind kicked in and started with the “Is she trying to get rid of me?” routine – and she was in her way, like a mother bird pushing the fledgling out of the nest. I was grown. My life was my own then, and I had to make a proper go of it. Of course I was always welcome at home and I stayed there all through university and a little after, but at least I knew how she felt and I knew she had faith in me. She and dad trained us all well (I have siblings too) and we went on to have happy lives for the most part. As we enter the Virgo interval of the year, it feels appropriate that we look at mothers and the Mother (Earth/Nature/Goddess – whatever we want to call Her). Our mothers nurtured us in their wombs and gave birth to us physically, and Virgo does the same with us spiritually, hence its association with the Mother. Virgo is the sign that describes the process of what would best be called 'spiritual gestation', for it is through this sign that we receive the spiritual 'tools of the trade' as it were, and begin the long process of training and work (for which Virgo is renowned) which leads us ultimately to the door of liberation from this world, or the cycle of life and death. 'Liberation' is but another term for 'birth' into a higher state of being, even though that state of being has been with us since the very dawn of our days so many eons of time ago. Virgo is a difficult sign to understand in some ways, but in doing so we come to understand ourselves much better: The Mother shows us the intimate workings of our mind. So, all hail the Mother (Virgo) and her peerless care and nurturing! What follows is a longer than usual look at this most august of the zodiacal signs. There is a lot here and a lot of it is technical, but I feel it is necessary in order to get a firm handle on what Virgo is really all about. Most people associate Virgo with work, precision, healing, a critical nature and the like, and the sign is indeed associated with those things. However, the truth is that the outer action and expression of the sign is but the façade of what is actually one of the most profound of the signs in the zodiac – and one of the most human. It confers the method by which we all eventually arrive at the feet of the Master, our own higher Self. Ultimately, Virgo represents the hardest work that anyone ever has to do, and that is to actually fathom the entirety of the human mind and to then turn that mind toward service to others instead of one's own self-interest. Much of what follows will have a strong Buddhist leaning, but this is only because Buddhist practice – specifically meditative practice – gives the clearest indication of what this sign is really all about. 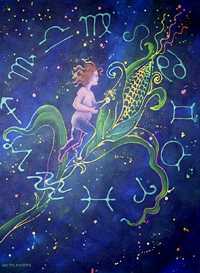 Virgo is said to be the oldest of the zodiacal signs, predating even this present solar system. It is connected with matter and with the evolutionary process, “...which is to shield, nurture and finally reveal the hidden spiritual reality.”, hence its connection with the Great Mother. Virgo is said to be the guardian of the Light of Wisdom. The sign stands for the 'womb of time' and symbolizes “..depths, darkness, quiet and warmth...wherein secrets are discovered and eventually brought to 'light'.” Hence, there is a strong emphasis with Virgo upon gestation – but gestation of what? It is said Virgo gives care and nurturing to the Christ-child (the wisdom-being or indwelling Soul) while the path to full enlightenment or realization is trod. What exactly does that mean, though? The key to understanding Virgo begins in understanding that the process started in Gemini (the union of calm-abiding and insight, as we saw in the Gemini letter this year) finds fruition in Virgo, if we can use such a symbolic description of the quality of the process. Whereas Gemini ultimately gives us the method to liberation and full enlightenment (initiation into the Mysteries), Virgo provides the vehicle (application) to get there. In other words, in Virgo we have the full implementation of the processes begun in Gemini, leading the practitioner/disciple right to the door of full enlightenment – the 'birth of the Christ-child'. The preceding paragraph opens the page on what I have found a most fascinating exploration of mind and the human psyche as it seeks to undo itself. In a way, the life of the spiritual path is a paradox. On the one hand we seek to come to what might be considered an ultimate understanding of our purpose in life, why we were born here, and to make meaning of this life that we have the privilege of living. Then, on the other hand as we progress on that path we more often than not come to understand that we actually understand very little and that much of what we thought had real meaning in life (much that we have chased after) actually has little meaning at all, if any. What we find is that our worldly life is in a constant state of change and that nothing of the world really has any permanence. We unlearn so much of what we are conditioned to perceive either through environing conditions or by karmic predisposition and what most people call the spiritual path is more often than not simply a long process of purification until we have finally removed all the obstacles that stand in the way of our full realization. Virgo plays a big part in the process of purification and purity has always been associated with the province of Virgo – purity in all aspects of life. So, we have purity, revelation, matter, the Mother and gestation, all key words associated with Virgo. The preceding points set the framework for our discussion. We are told in occultism that “...space is an entity and is but the phenomenal appearance [not material experience] of that entity.” Further, “It forms one unbroken field of activity in constant ceaseless motion – an eternal medium for the exchange and transmission of energies.” So, we have matter = space = phenomenal appearance. Space is an appearance, a phenomenon, an illusion of materiality. If matter is an illusion, then, and only a phenomenon, we are suddenly faced with the fact that all we see before us – all experience in the material realms – is illusory. This is a very important point with regard to Virgo, for Virgo is known in human expression as assign that 'cuts through the crap'. Illusion is dispelled through analytical and focused attention. Furthermore, since all matter is phenomenal, then all material phenomena have a certain duration in time and space and are thus impermanent. Now, before we start giving ourselves over to nihilistic thinking, we are also told by the Great Ones (the ones who have gone beyond the veil of mater and know the truth of the matters we are examining), that nihilism is an extreme view, that we do in fact and indeed exist, as does all before, within and around us, but that we simply misperceive things as they truly are. When it comes down to it – and any realized yogi/yogini can tell you this – matter is a concept, a mental construct. As such, then, we only exist within it so long as we are mentally attached to it or functioning in those realms. This recognition lies behind the basis of siddhis (yogic attainments or powers), for once we understand how a thing works and we can get at the constituents and mechanisms behind them, then we have power over the phenomena. We can literally change the world in an infinite number of ways. We also come to realize that our very thoughts have a profound effect upon the materials or phenomena around us. Thought, and thus knowledge, is indeed power in the hands of those who are able to direct it. Stop and consider for a moment that if our thoughts have effect on the matter within and around us then our thoughts are what bind us to our material circumstance. Yes, we all know this intellectually, but to put it in terms of a subjective understanding of the matter (pardon the pun) we soon realize that every current of thought must somewhere manifest an effect. If our thoughts are pure, then the effects will not bind us. If our thoughts are coarse and grasping, then we further bind ourselves to the material (phenomena) in which we move and have our being. Virgo teaches us control over materiality. It teaches us to be pure in our thinking. It teaches us to transcend the coarseness of our minds. It teaches us to ultimately realize the emptiness of phenomenal life and to take us to the portal where we can step through and realize that true emptiness is simply the ceasing of the machinations of the mind and the full realization of Being. In a sense and allegorically, the Mother trains us and takes us to the doorway, but we must step through the door of liberation on our own and leave the Mother behind. In Buddhism the Mother is sometimes called 'the Void Sphere of all things' – Prajnaparamita, the Mother Consort of all the Buddhas (who are genderless, by the way). Virgo is where one realizes 'pristine awareness' (awareness unstained by conceptual thought of any sort). 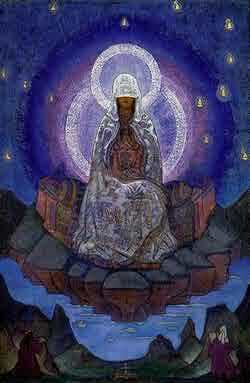 It is this pristine awareness to which Virgo refers – the purity that lies beyond all thought. Experience in Virgo “...confers mental introspection and critical analysis and stabilizes the fluidity of Pisces” [representing the dualistic nature of the human mind in its lower aspects]. Virgo “...produces that interior struggle between the ...self, form consciousness and soul within all forms.” “Virgo represents the caves, out of which the Christ emerged...” My recent experience in Tibet has really given me insight into this last statement. Typically, in the Himalayan region when one had reached a certain point of attainment in their practice in the old days (and it still goes on today, but in far lesser numbers) one would be sent to a retreat center or to a lone place away from everything and everyone and they would spend a certain term of time in solitary meditation, usually in a cave in Tibet as there are quite a few of them there, during which time they would be seeking certain realizations and attainments (siddhis). They would, in effect, be engaging in this mental introspection and critical analysis referred to before with the expressed intent of stabilizing the fluidity of the mind to the point where obstacles to the yogi(ni)'s desired attainment would simply fall away and they would realize what they had sought. In essence, they would 'retire to the bowels of the Mother' and therein engage in the struggle to 'wrest themselves from the grasper' -the mind, only emerging when they were victorious in that phase of their work. This would typically happen many times in the course of one's evolution, over at least several lifetimes or even within one life. Purity and pristine awareness – these are the qualities toward which every Virgo type unconsciously strives and why the Virgo type can be so critical of others at times, when in point of fact they are actually projecting onto others what they should be doing with their own minds. To have a mind unstained by concept is a type of mind beyond all but a few at this point in the Earth's history, certainly, to me, seeming a far way off. Yet, once we consciously take up the spiritual path, it is our ultimate goal. Virgo is a very important and powerful sign in the evolution of the human psyche and it is the revealer of the good, the beautiful and the true, hence its connection with healing. Is that not what we expect from our mothers – the good, the beautiful and the true? For those readers familiar with Buddhism and who study the relationships between the zodiacal signs, the axis of Virgo-Pisces is what I would call 'the union of Voidness (Virgo) and Bliss (Pisces)'. It is indeed the axis of the birthing of the World Savior, the Mother and the Son, of non-abiding Nirvana. The preceding has been a long exposition but it was necessary, I feel, to get to the real crux of what is actually represented by the sign Virgo. In part two of this article, Malvin Artley continues his exploration of the esoteric meanings of the Virgo Festival of 2009.